The Story of Perfume by Harvey Prince Organics is a subscription box that sends luxurious perfume along with samples of best-selling bath, hair and body products. Each box contains two perfumes created exclusively for subscribers, two samples of products from Harvey Prince’s best-selling bath, hair and body lines and two 2ml samples of their most popular fragrances. Every product is 100% cruelty free, vegan and gluten free. First off- I absolutely love this box! It is so clean and classy looking and the unicorn had me at hello. It also makes me think of Cinderella with the carriage and who doesn’t love Cinderella? This box will be perfect to use as gift wrapping for a friend. I absolutely love the packaging paper everything was wrapped in, has a very enchanting feel to it! Products: Two private blend, luxe Harvy Prince perfumes available only in The Story of Perfume, two samples from their best-selling bath, hair and body line and two 2ml samples of their most popular luxury fragrances. Check out the Perfume Subscription Box Directory for more perfume boxes and make sure to add The Story of Perfume to your subscription list or wishlist! Each Story of Perfume box comes with a welcome card. What is unique about this perfume subscription is how there is a story to each of the private blend perfumes on the Harvey Prince Organics website (hence The Story of Perfume name). I liked this smell! It smelled outdoorsy but soft and I will wear this again! Although the website has different size bottles of perfume this scent and Kashmiri Saffron are only offered in the 7ml roller ball. There are notes of sweet cardamom, spicy cumin, soft clary sage, dewy rose, and soothing chamomile danced with deep cypress, clean musk, warm amber, and Mysore sandalwood notes. This wasn’t a bad smell but it wasn’t for me and was a little strong. I will be re-gifting! There are notes of fresh rose, dewy jasmine, and lush lily mixed with sensual saffron, earthy patchouli, soothing sandalwood, deep musk and warm cashmere in the cool Kashmiri air. Closer look at the roller ball design and size of the perfume. I am addicted to this smell, seriously. It is a comforting smell where it is not too strong but amazing. I put it on before I went to sleep and my hands felt super soft when I woke up! I will definitely use this lotion. I like the smell and texture of this masque, and how soft it made my hair feel. It’s also a bonus the mask is sulfate-free and paraben-free. I will use this masque again! Very nice scent! The card says there are notes of Italian lemon, pink grapefruit, Japanese lily, Moroccan jasmine, dry woods, sweet iris, Indian patchouli, Madagascar vanilla and clean musk. This has an everyday feel and I will wear this again! I estimated the cost on both 2ml samples because they did not have single 2ml samples listed on the website, only bundle packs of three. This sample smelled very sweet and I liked it! The card says there are delicate notes of South African Freesia, Japanese Orange Flower, Moroccan Rose, Turkish Cyclamen and Indian Tuberose. Closer look at the 2ml sample size. 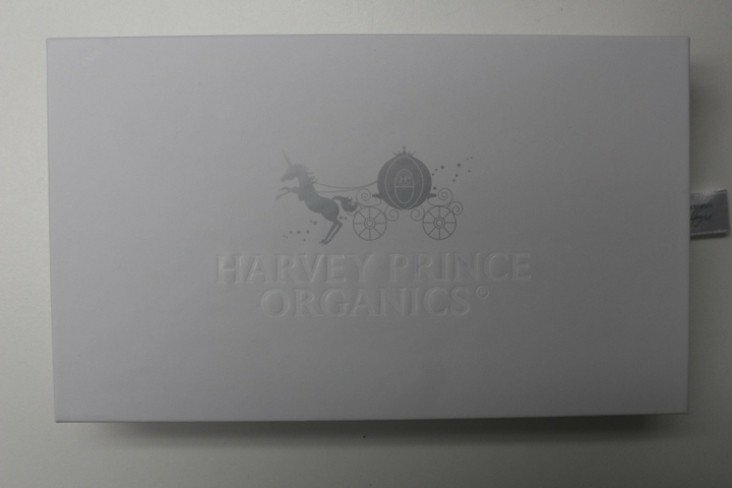 Verdict: I liked The Story of Perfume box from Harvey Prince Organics. The presentation of the box alone was awesome! I enjoyed the majority of the perfume and it was a plus that everything was organic. There was a nice variety of perfume in addition to the two body care items so I recommend this to anyone who loves scents or Harvey Prince products! Every product had its own unique scent and the individual stories made you feel as though you traveled to the exotic destination listed. What do you think about The Story of Perfume box by Harvey Prince Organics? Did anyone else receive the same scents? Nancy discovered the world of subscription boxes once she came across My Subscription Addiction in early 2013 and signed up for a few. She is a lover of all things fashion, weenie dogs, the 70s and unique finds in subscription boxes. How do subscribers rate The Story of Perfume? Do you subscribe to The Story of Perfume? Add your rating now! This subscription has been the worst one that I have ever dealt with, and I have subscribed to almost everything throughout the years. I signed up for a six month subscription with a promo code, and the first month they sent one small rollerball instead of the entire box. I was worried that it was because I had used a promo code, but I wanted to give them the benefit of the doubt. I contacted them and asked for the entire box. Michael sent it, but both small rollerballs were leaking. The following month, one of the small rollerballs was leaking and I contacted them and the replacement leaked as well. The third month this occurred again. They use small, cheap, defective rollerballs for this subscription, and if you tilt them over they leak everywhere. I carry my perfume in my purse and I do not have unlimited counter space in the bathroom to store a bunch of defective rollerballs. Last week I received my fourth box from them. Again, one of the bottles had leaked all over the box. I finally asked for a refund of the box that I had received and the two remaining boxes. They told me they would send a purse spray, but could not refund me for my two remaining boxes. Michael was completely unapologetic and unhelpful, and it took a week for anyone to even respond to my emails. Even with my 40% off promo code, I literally have thrown $79.20 into my garbage can with the added bonus of a headache every month from the strong scent. Please, do not waste your money on this subscription. They do not care about their customers, and I don’t want other women to waste their money as well. I got an Harvey Prince sample when I made an order on Petit Vour (along with a lot of other extra samples)… but I haven’t gotten around to using it yet (but the smell I get from the packaging seems lovely). And I’m the kind of girls who has hung around her three 2mL/0.6fl roller bottles from Lush for YEARS, probably because apart from not wearing perfumes very often I tend to use essential oils also when switching up. I really hate seeing the negativity towards HP. I like their perfumes and products and love that they are cruelty-free. But I too have felt spammed by Birchbox. I think this box is a great value, but a lot of perfume for me to use. I am going to keep watch on the new scents and pick up the ones I want to try when they have coupons for the website. I have received a few of HP sample vials and haven’t had a chance to try any of them yet. So I cannot say that I like their scent or not yet. I like that this company is vegan, cruelty-free and ingredient conscious. My only issue with this subscription is that I receive too much perfume in one month. I get Scentbird which they send 1 x 8 ml sprayer a month. If you spray 4 spritz a day, it will last about a month per their estimate. I only use it during work days and only 2 spritz a day, so my Scentbird supply lasts about 2 months. Scentbird offer an option to skip a month(only one month or cancel), so it works for me. One HP box will last me about 4 months, lol. But now I want to try my samples at home! Why is their so much negativity towards HP? Is it overexposure or quality of the products? Overexposure started it for me. I don’t mind getting a one-off perfume sample that I don’t care for. But when I get about 17 other samples from the same brand in a year, it’s ridiculous. And, I don’t like florals at all. Every HP perfume I’ve smelled is floral. If you like florals, and the vegan cosmetics thing is important to you, HP is a wonderful brand. I don’t have any complaints about the quality. I just really don’t like the scents and get tired of seeing them over and over again. Everywhere. Birchbox (the worst offender), Petit Vour, Vegan Cuts beauty, and at least a couple of other subs. I was thinking the same thing. It would be nice if Birchbox would stop sending HP products. I also received two of the HP, Jor’el Parker, roller ball perfumes in less than six months thanks to ipsy. Every HP product smells the same to me. I wish sometimes we could just opt out of perfume samples all together, since it’s so subjective. However, I do think the packaging is adorable. Thank you, Nancy, for the review! Yeah, the concept sounds wonderful except that its attached to HP. Maybe this means they will STOP sending it in Birchbox. ? I’m pretty sure there’s already a Harvey Prince sub. We call it Birchbox. Oh my, I can’t believe Harvey Prince made a sub box. We already get a ton of it in other sub boxes. I did like it; but now I’m drowning in all kinds of samples of it, I don’t need more. Why couldn’t Atelier cologne do a sub box?? That Cédrat Enivrant perfume I think I got in a LE birchbox was the greatest discovery ever!! It’s so delicious and unfortunately is $70/bottle. Yes. I like all their scents. Scentbird has a few…Would like to see a Crabtree and Evelyn sub or even Caswell Massey?? They lost me at Harvey Prince. But, clearly there is a market for HP stuff so I’m glad you enjoyed the box, and thanks for the review!